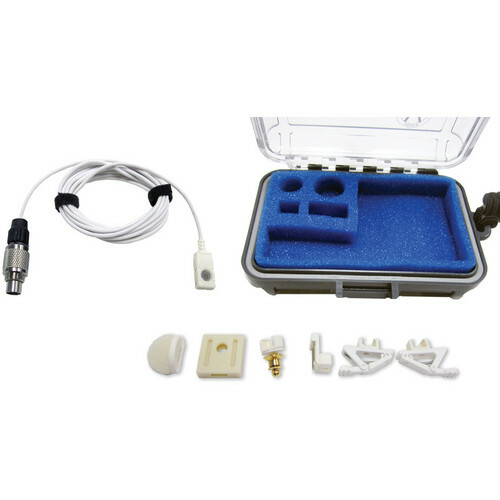 The white VT500 Omni Lavalier Microphone with Binder 5-Pin Connector from Voice Technologies is suited for performing talent in broadcast, theatre, and film. This high-quality, all-purpose electret condenser microphone system features a Binder 5-pin connector and is compatible with Audio Ltd. TXPH (En2) wireless transmitters. The special injection-molded design makes this microphone rugged and shockproof. In addition, a flexible cable offers enhanced isolation from rubbing noise. Speech clarity is optimized by a slight frequency emphasis, thereby giving excellent voice reproduction, while eliminating placement constraints.